This weekend in Paris, there is a Christmas Market with a difference taking place: Joyeux Market at our favourite Seine-side venue in town, Wanderlust. On Saturday 15th December from 2pm to 11pm and Sunday 16th December from 11am to 7pm you can get your Christmas cheer on with some festive shopping at stalls from some of the most exciting places in Paris - there will be coffee from Ten Belles and Le Bal, food from Carrie's Bio Dogs, books from Shakespeare and Company, nail art from Kim Laidlaw Adrey and hair by Rubi Jones, a photo booth from The House that Jack Built... There will also be workshops and activities on both days at the marvelously-named Wander-Lab. Festive fun and frolics for all the family and not a piece of standard Christmas Market tat in sight. Entry is €5 for adults, €3 for students and free for under 12s. 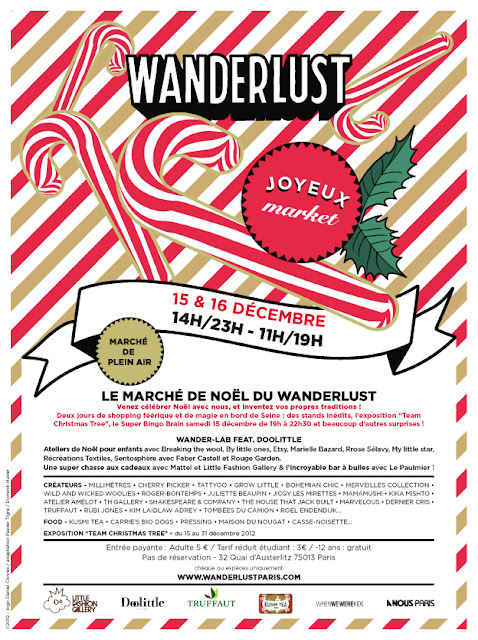 For more information, see the Facebook event here: Joyeux Market at Wanderlust. This sounds like a Christmas market I'd actually LIKE to go to! Thanks for posting!